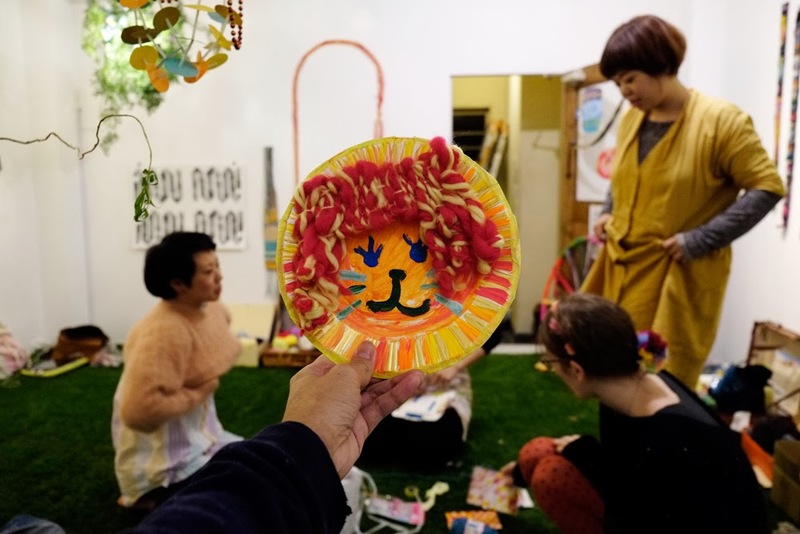 Sumoto Retro Komichi is a handmade/ craft fair held twice a year in the main city on Awaji Island. I was there today with my partner and will be there tomorrow, Sunday 18th October 2015. It has a very nice atmosphere and mix of people looking around. I just got back from a short holiday in Marrakech and I was prepared for some beautiful patterned tiles but I wasn’t expecting all the amazing weaving! I wanted to buy them all. They have so many techniques. It gets very cold so warm blankets are essential. Recently I’ve been showing various groups of friends my take on backstrap weaving in various living rooms. I think anyone can do it, and I just like showing people because I love doing it myself. I like the simplicity of the process. Also, the variety of artifacts that come out of it are as unique as the people who make them. 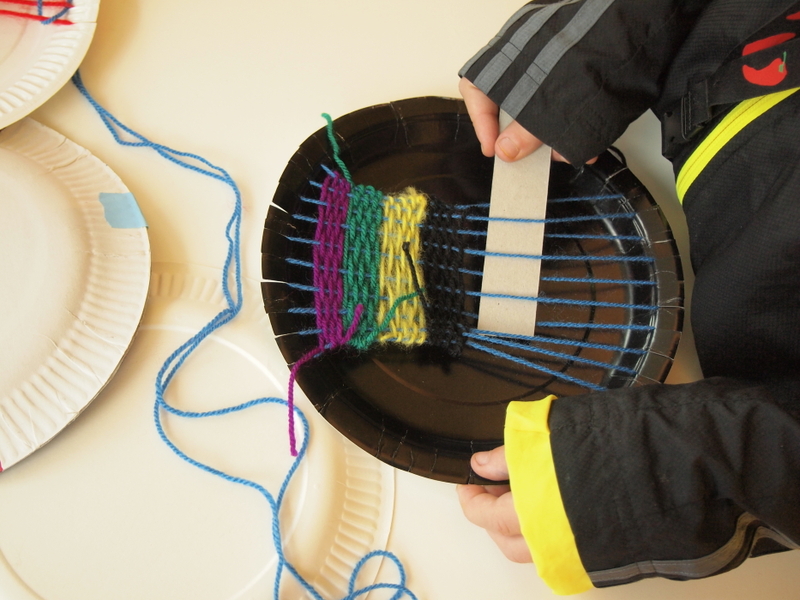 I am running a series of weaving sessions at SPOTLIGHT youth club in Langdon Park, London, UK. Week one was very successful. 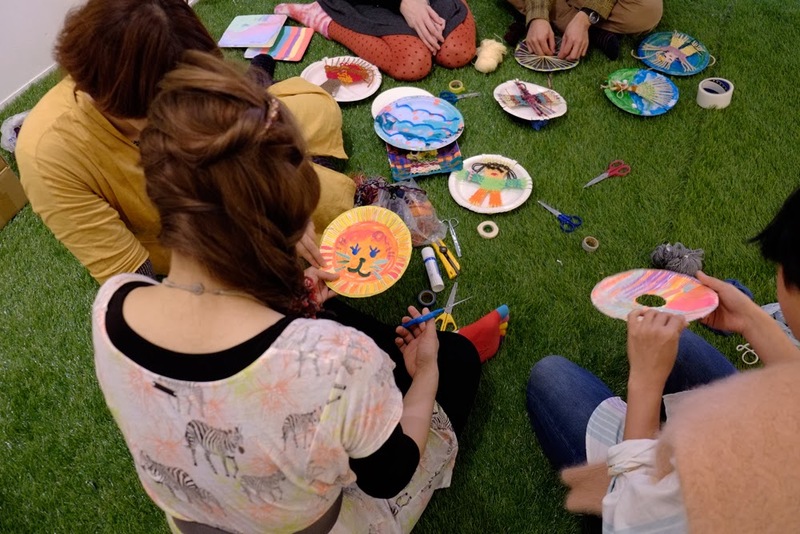 It is a drop in ‘cafe’ style event so has no clear beginning but the young people can do as much or as little as they feel like, which I quite like, because it’s after school. I dont want to make anyone do anything. 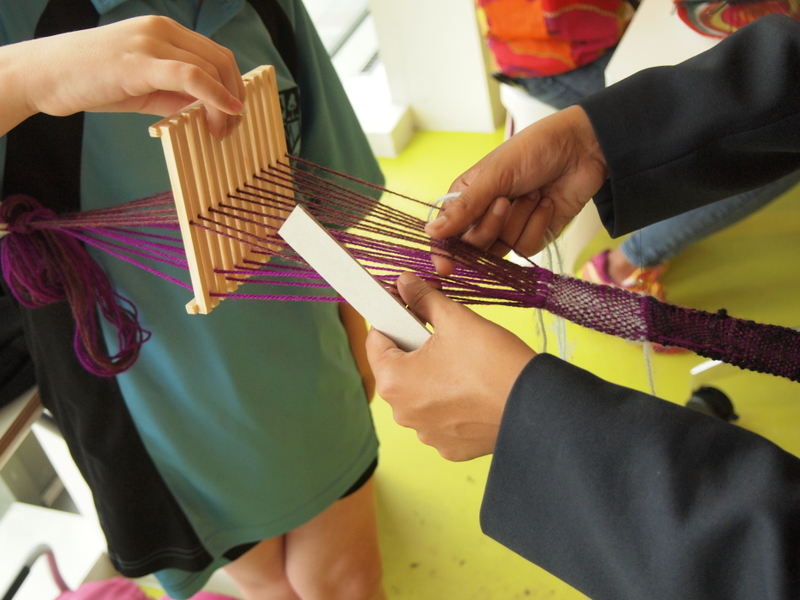 Thankfully, they were very into it (because its weaving!) I am always amazed how some people just get it straight away, and the kind of focus that it can inspire. him: so what will it be? me: with this, it could just be decorative, or you could make a belt, a guitar strap, a headband, trim. him: so in about a year you could make a bed sheet? [aRGH! thats not the point!!!] 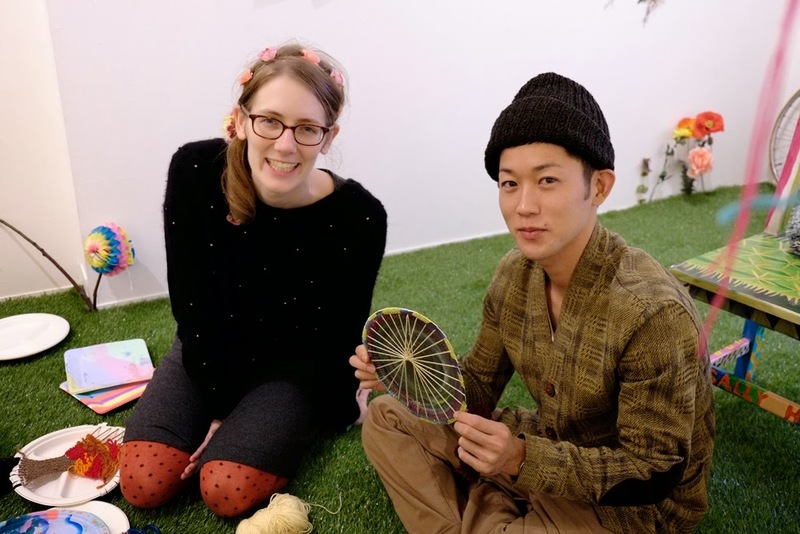 If I’d had time I’d like to explain that it is about construction, understanding how things are made, how the qualities of weaving (strong, not stretchy) can be used for different purposes. About working together, showing and explaining to each other what can seem a complicated process at the outset. 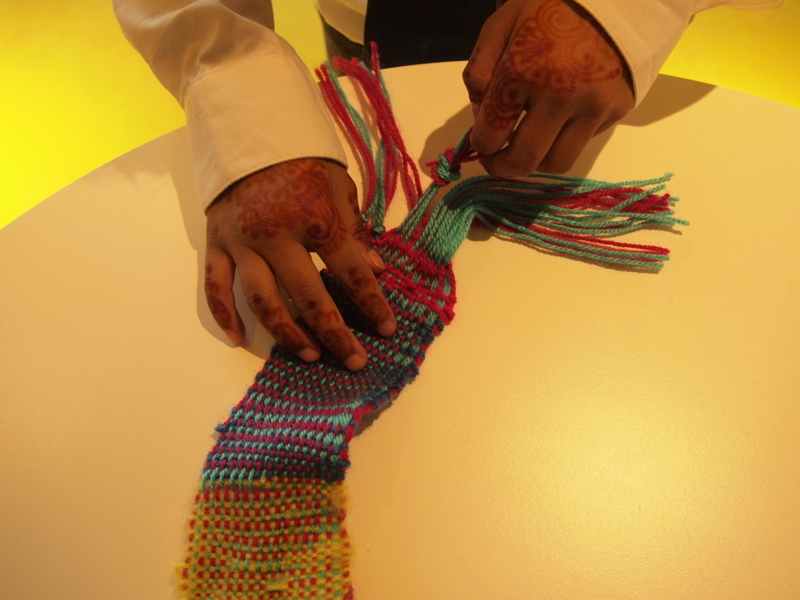 How you can create patterns, how colours can be created by combining yarn. How you can alter the style, thickness, texture by combining different thicknesses of thread or tension as you pull or slacken. Understanding how the clothes, carpet, seat covers, hat, basket, shoes, sails, flags, wallet, tent around you are made. Not by going to a factory and seeing an incomprehensible machine but by understanding the fundamental concept that people have been doing for thousands of years by DOING it for yourself! anyway, I think the kids got it! 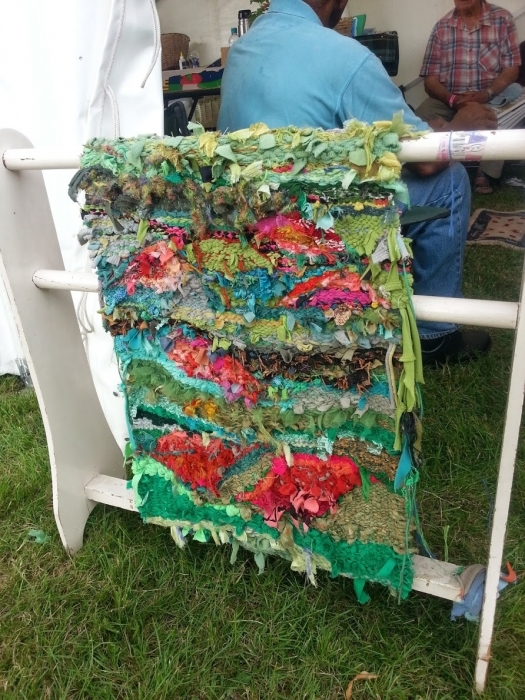 I went to the Lambeth Country Show 2014 and saw this great rag weaving on an old clothes horse. 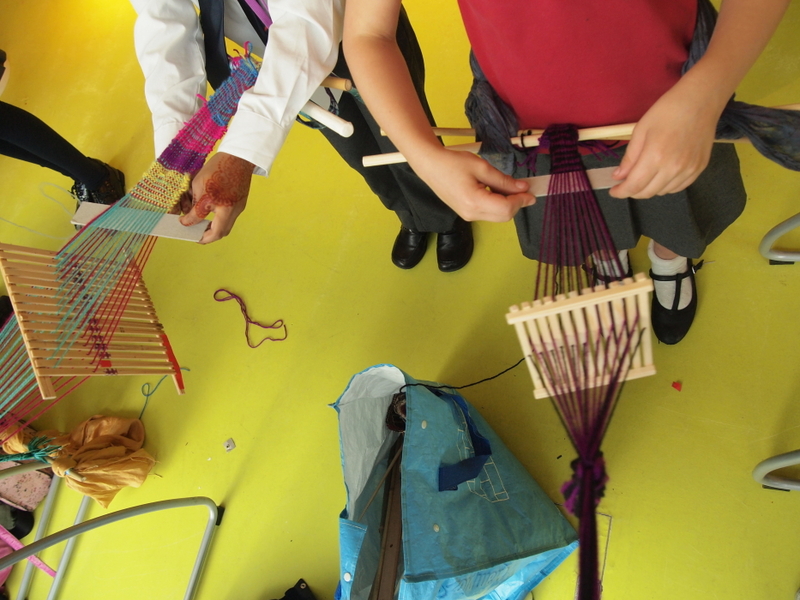 Karina was also running some smaller rag weaving workshops. 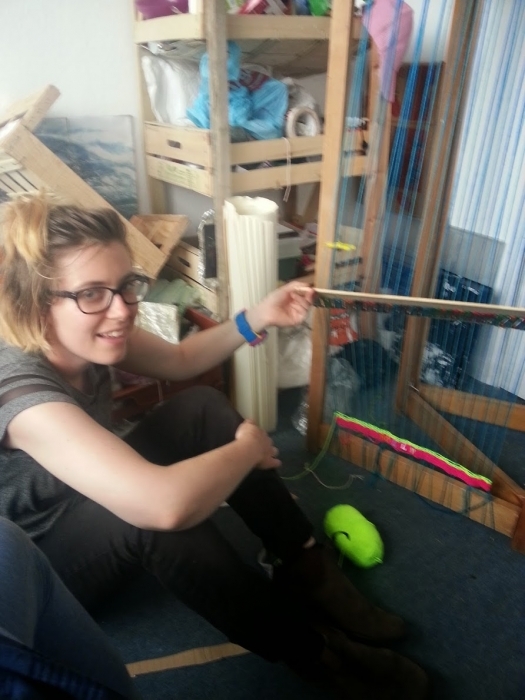 My Friend Holly asked me to help her with some basic weaving skills. 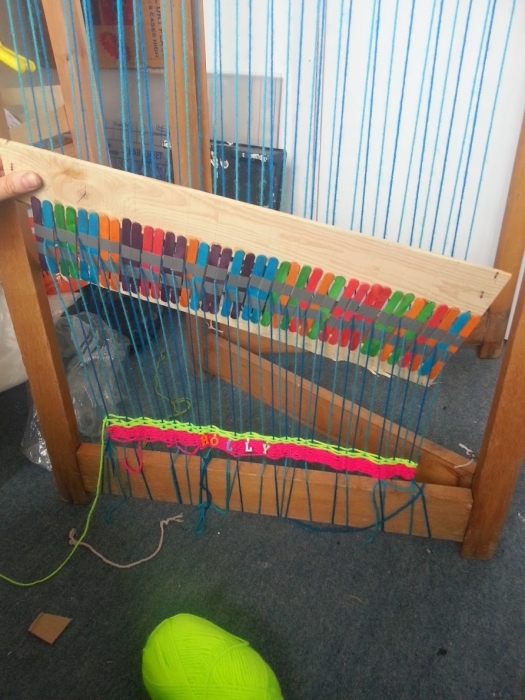 We made this colourful heddle and loom! When I got to her studio she had this big frame/folding screen leaning against the wall and I knew that was a good place to start. We popped to the 99p shop and got some lolly sticks, epoxy resin, and got a wooden crate from the veg shop. To make the heddle we taped together the lolly sticks, leaving a space in-between for thread and then glued them to 2 bits of crate. 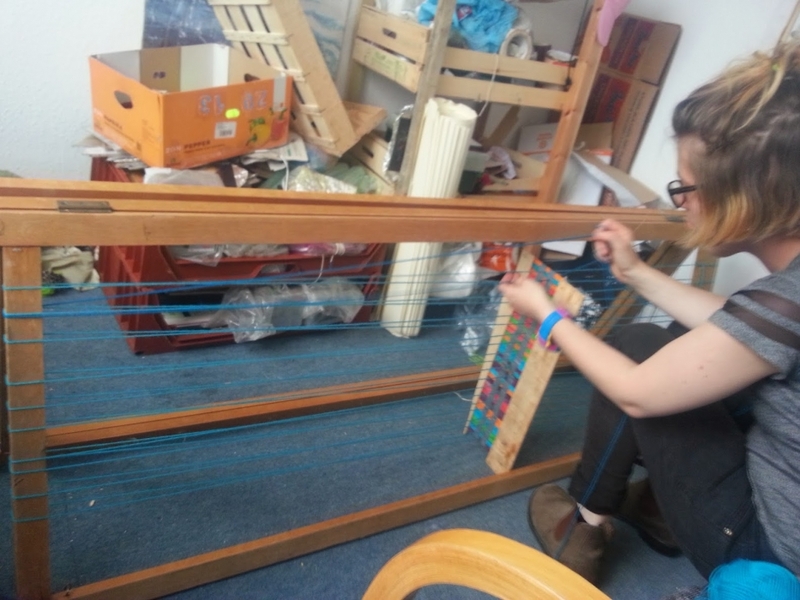 To make the warp we used 2 bits shades of blue, to make life a little easier. we just threaded around the edges of the frame and through the holes we’d made. It took a few hours and now lets see if Holly enjoys it enough to weave the whole thing. 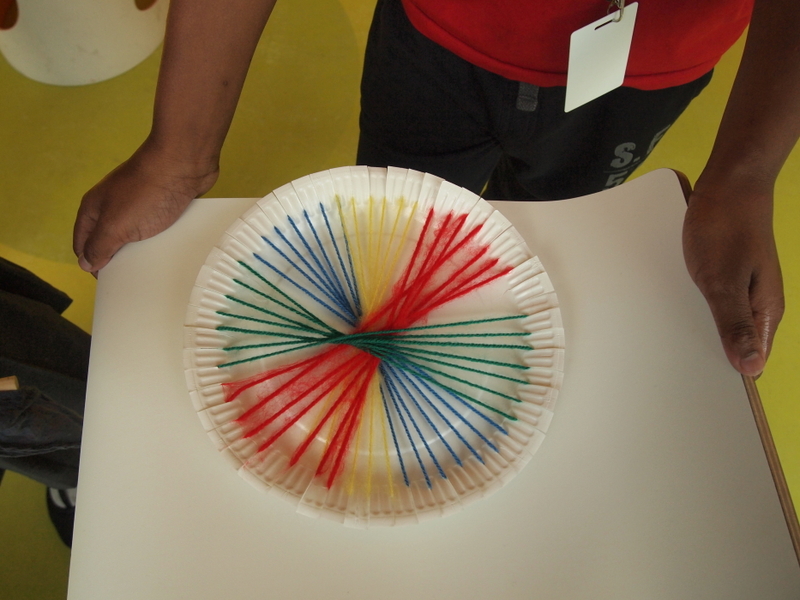 Paper plate handweaving workshop – 2 hours. 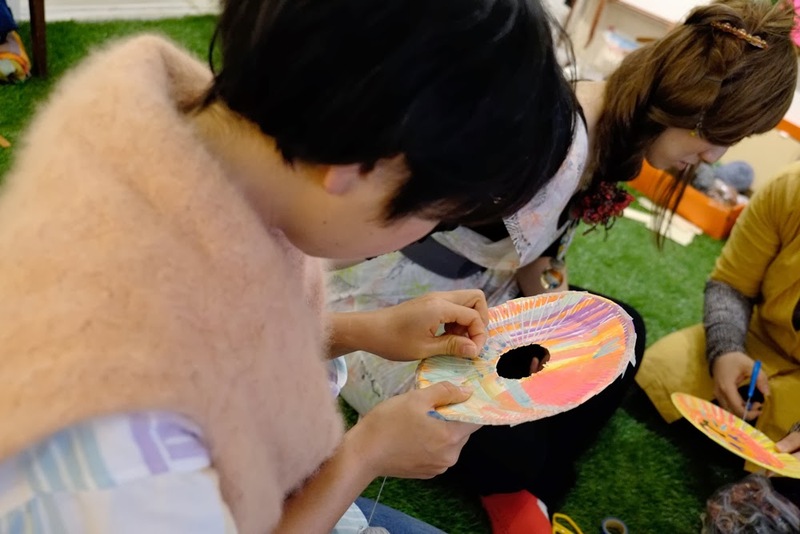 including painting the plate and creative art weaving! Some nice bold patterns on these mini tapestries I’ve been experimenting with. They’re about 20cm tall. the shapes are inspired by the colours, if that makes sense. 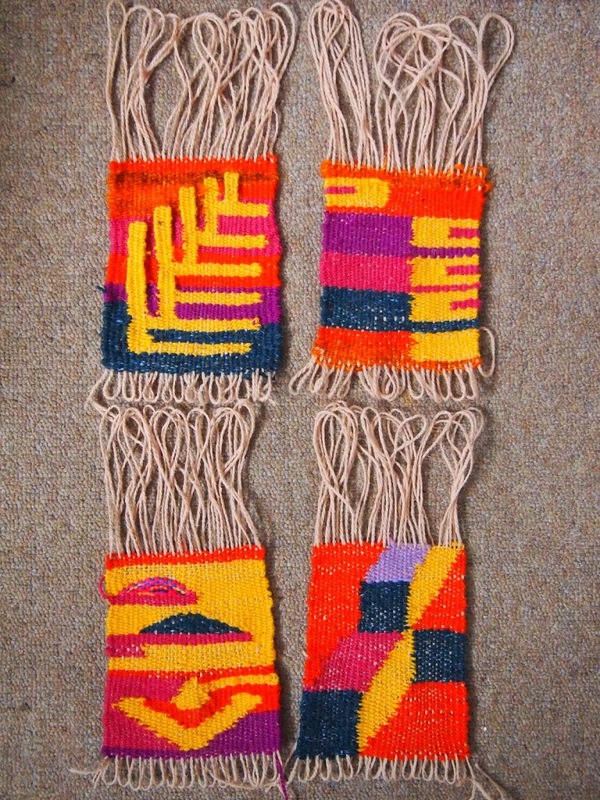 easy weaving! could be hung as a nice display on a bit of dowel. 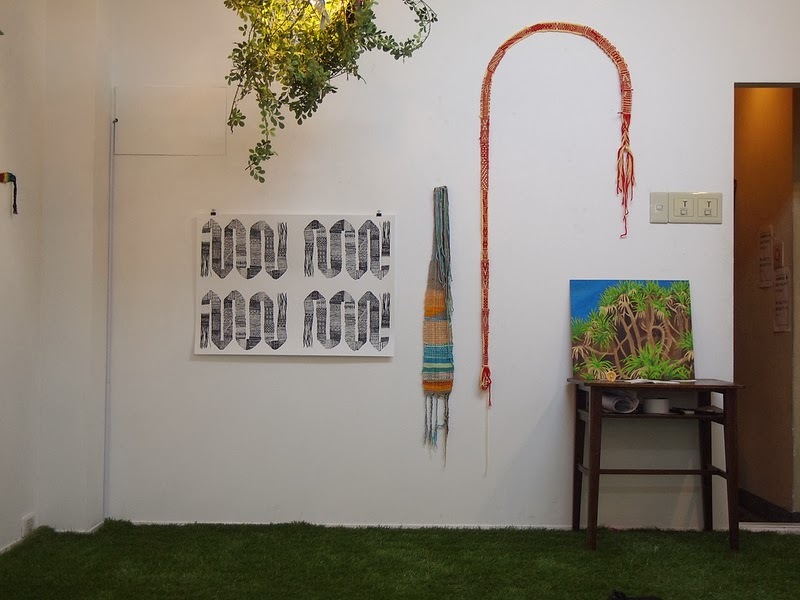 My work at our three-person show COLOR JANGLE 2013 at LeCoccole, in Osaka, Japan. 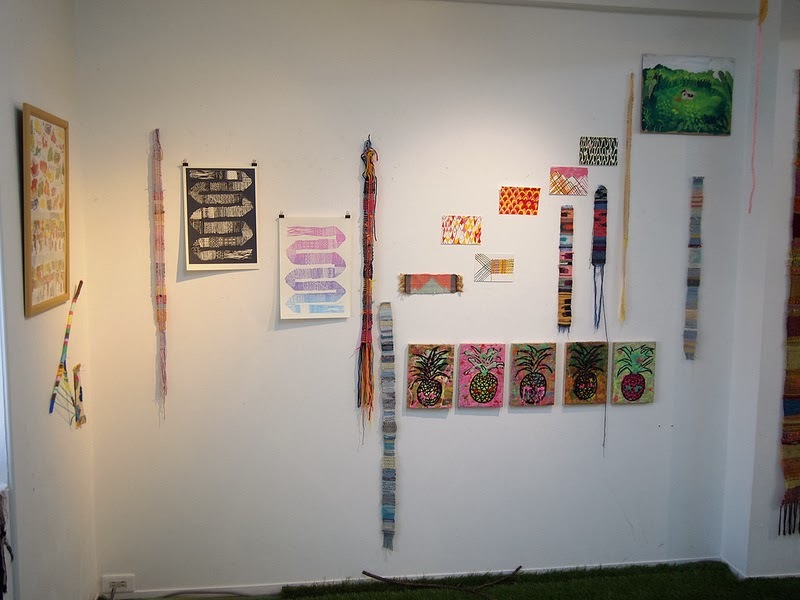 Silk screen prints, weaving and painting on show. 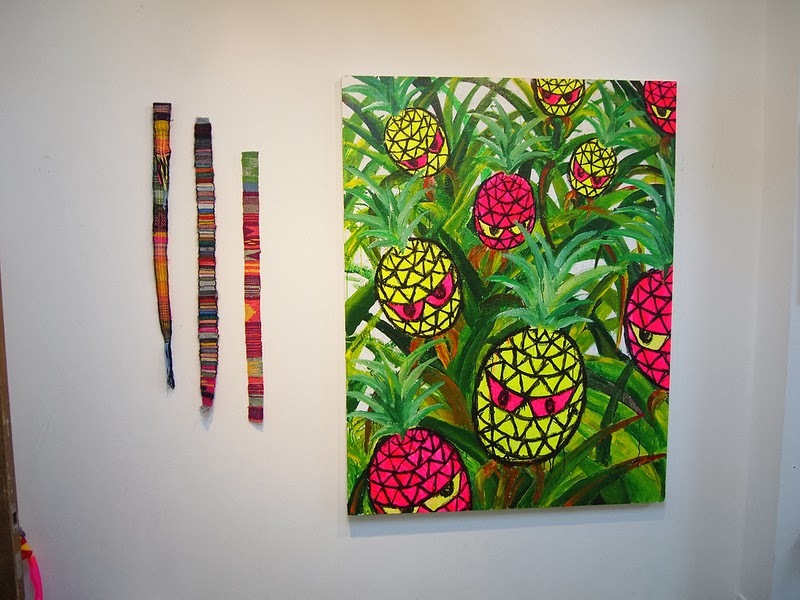 The large pineapple painting and the 5 small pineapple paintings are by Junichi Okada. 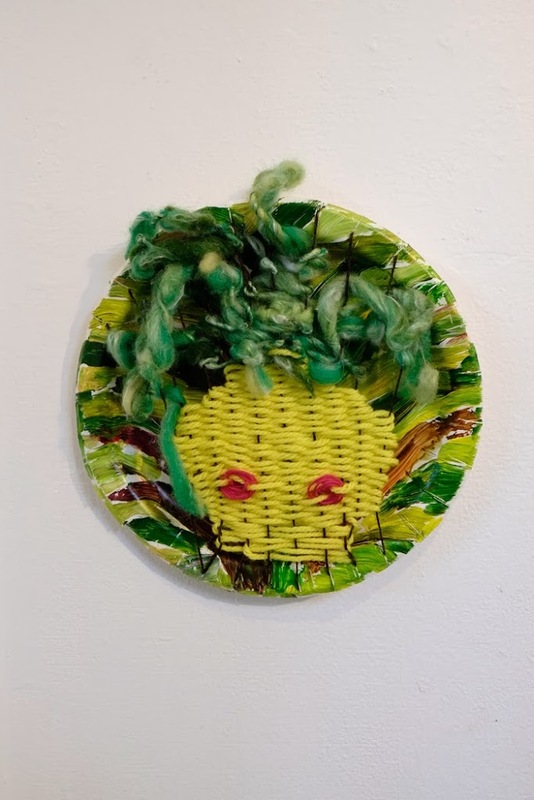 I am an artist, illustrator, weaver and workshop facilitator currently living and working in London, UK.